In the biggest such revelation since Clarence Walker announced on Saturday Night Live that he was secretly the fifth Beatle, comedian Nate Fernald has dropped a bombshell on the world of comedic-interview-based podcasting with the revelation that he has been secretly cohosting WTF With Marc Maron for the entire run of that program, beginning in September 2009 and now totaling well over 500 episodes. The reason WTF’s audience is just learning about this now, according to Fernald, is that Maron has ungraciously yet painstakingly edited his cohost’s contributions out of every last episode. The familiar image of lone wolf Marc Maron interviewing comics, musicians, actors, and other notables in his cluttered California garage has been, it seems, a partial fabrication born of ego and convenience. All this time, Nate Fernald has been at Maron’s elbow, trying to steer the conversations and, more often than not, being rudely ignored both by Marc himself and the guests. 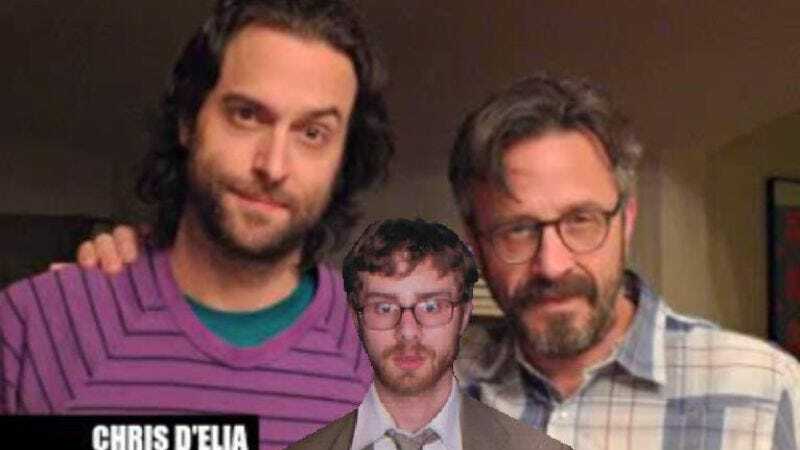 To prove this seemingly wild allegation, the spurned comic has released an unedited version of a recent WTF episode featuring Undateable star Chris D‘Elia. It now seems clear from the newly-uncovered audio that listeners only heard two-thirds of that conversation. While Maron and D’Elia trade comedy club anecdotes and discuss the latter’s long-ago obsession with Luke Perry, poor Nate Fernald tries without much success to get a word in edgewise. Though he perks up at a fleeting mention of Doogie Howser, MD, for which D’Elia’s father directed three episodes, Fernald simply cannot break into the conversation. Particularly sad is a failed attempt to riff on the subject of “spicy meatballs.” Neither Maron nor D’Elia will take the bait. So discouraged is Fernald that he simply gives up mid-interview and leaves to watch a movie, the audio of which can clearly be heard in the background for the remainder of the show.